"At Gibeon the LORD appeared to Solomon during the night in a dream, and God said, "Ask for whatever you want me to give you." Soloman answered, "You have shown great kindness to your servant, my father David, because he was faithful to you and righteous and upright in heart. You have continued this great kindness to him and have given him a son to sit on his throne this very day. "Now, LORD my God, you have made your servant king in place of my father David. But I am only a little child and do not know how to carry out my duties. Your servant is here among the people you have chosen, a great people, too numerous to count or number. The Lord was pleased that Solomon had asked for this. So God said to him, "Since you have asked for this and not for long life or wealth for yourself, nor have asked for the death of you enemies but for discernment in administering justice, I will do what you have asked. I will give you a wise and discerning heart, so that there will never have been anyone like you, nor will there ever be." One of my favorite things about visiting New York is seeing the beautiful architecture. The buildings have a history that we lack here in Southern California. One of my favorite buildings is St. Patrick's Cathedral which is across from another of my favorite spots, Rockefeller Center. I had not had a chance to go by it yet on this trip but I had wanted to. 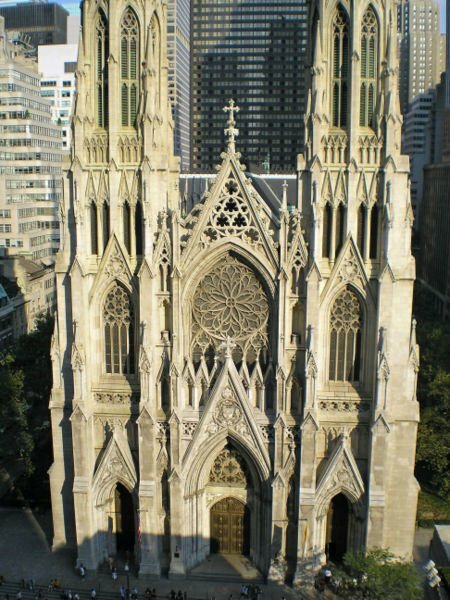 The St Patrick's Cathedral, at 50th Street and Fifth Avenue in Manhattan, New York City, is the largest decorated Neo-Gothic style Catholic cathedral in North America. 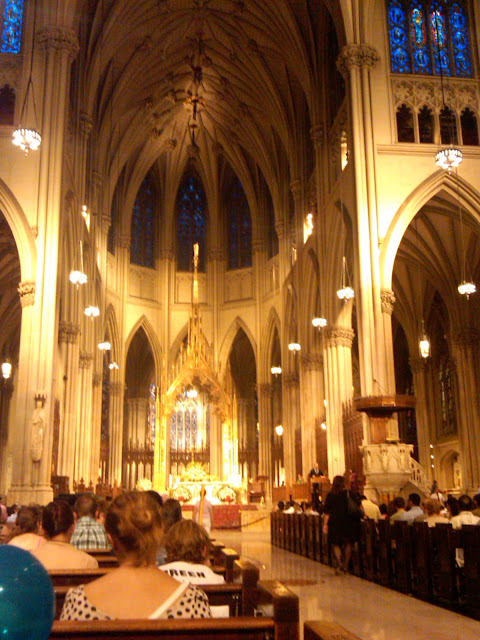 It is the seat of the archbishop of the Roman Catholic Archdiocese of New York. 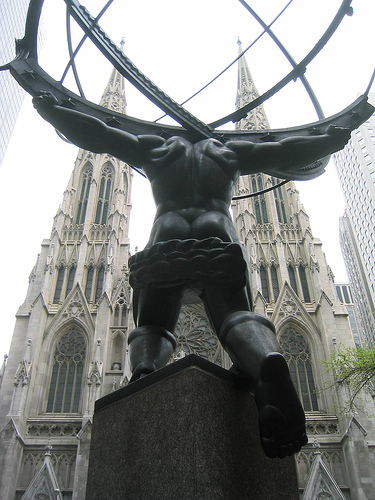 The St Patrick's Cathedral is located just across from Rockefeller Center. 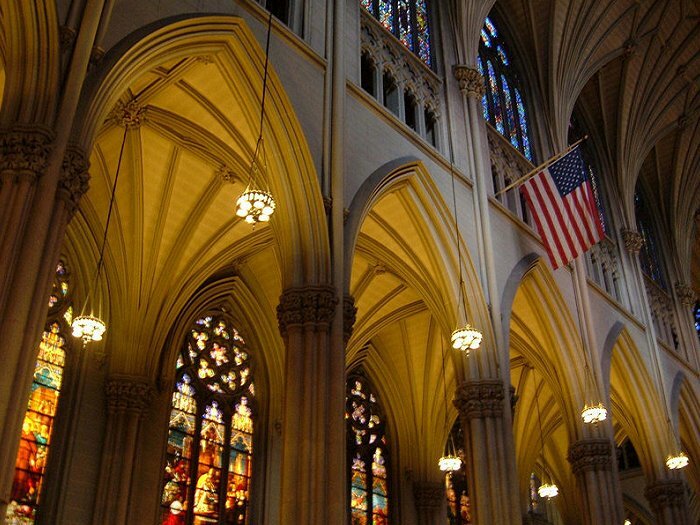 The Diocese of New York was created in 1808. It was made an Archdiocese by Pope Pius IX on 19 July 1850. 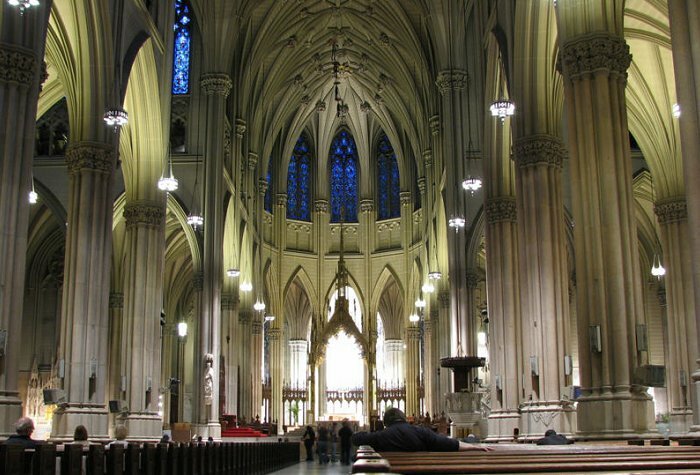 Following that, Archbishop John Joseph Hughes announced his intention to build a new cathedral, to replace the old St Patrick's at Prince and Mott Streets. Work started on the new cathedral in 1858. It was designed by James Renwick Jr in the Gothic Revival Style. The American Civil War interrupted construction of the cathedral, but work resumed in 1865 and it was completed in 1878. The towers on the west facade were added in 1888. Work on Lady Chapel began in 1901. Its stained glass windows were made in England between 1912 and 1930, when the great organ was installed. Last Sunday, my last day in NY, as I was leisurely walking back from the Metropolitan Museum of Art to my hotel in mid-town, I spotted it across the street. I crossed 5th avenue, walked up the steps and went inside. I had no idea what time it was but decided to go in and sit down for a bit. I needed to rest. 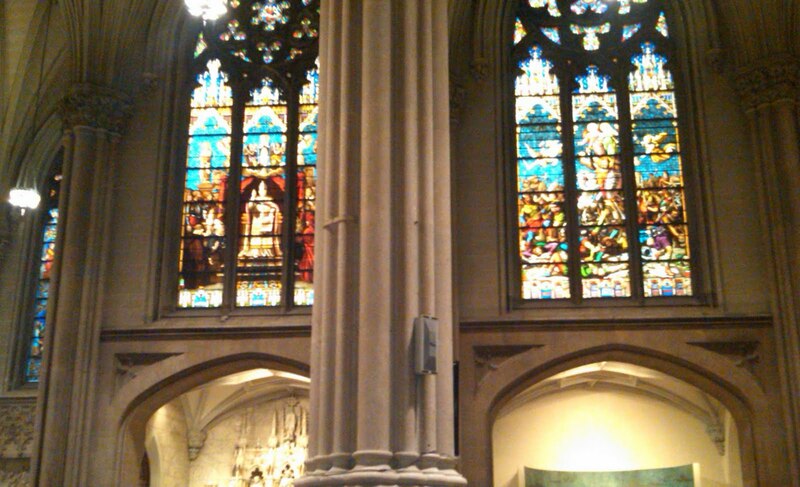 Just as I sat down the beautiful pipe organ began to play. It turned out I was right on time for the 5:30 mass. It was just beautiful. The priest was young - he said he had only been a priest for 3 years and it was his first month at St. Patrick's. The reading he chose was from 1 Kings and it was about Solomon asking the Lord for wisdom. The priest said that the passage resonated with him as he could relate to what Solomon was feeling; the inadequacy he felt being so young and inexperienced. He mentioned bumping into the columns. And he said what he loved about the passage was that it reminded him that many of us feel that way - that we feel immature and unsure of what we should be doing and yet this passage tells us that we all have this Spirit - God's Holy Spirit who will guide us if we will just listen. It was a beautiful moment for me. Sitting inside this awesome place just feet from the hustle of the streets of NY yet for that hour it felt like it was worlds away. Being reminded of God's great power and wisdom, which is mine if I just ask, was exactly what I needed.